Olive Garden's makeover looks nice, but it isn't going to solve Darden's problems. The Olive Garden is getting a makeover. Parent company Darden (NYSE:DRI) is trying to boost lagging sales at the Italian chain. But recent events bring Darden's overall game plan into question and suggest this makeover attempt will ultimately fail. Darden is made up of several restaurants. Red Lobster, Olive Garden, and Longhorn Steakhouse are the big three -- of which Red Lobster is the second-largest chain with 706 units. The seafood chain has been floundering for years. Rewinding the clock to late 2009, we watched Red Lobster's comp sales drop a jaw-dropping 7.9% in just one quarter. This prompted management to attack the problem head on with two secret weapons: a refreshed menu and a remodel. Darden called the remodeling project the Bar Harbor Design. The Bar Harbor, Maine area is known for its rocky ocean cliffs, fish markets, and fishing villages -- elements which were all incorporated into the face-lift. The new menu basically just included new items like lobster pizza and peppercorn grilled salmon. These initiatives didn't even remotely work to win back Red Lobster's clientele. So despite management's comprehensive plan, Red Lobster has lost customers for three out of four years since the rebrand. Now the best plan the company can come up with is to get rid of it altogether. Golden Gate Capital seems poised to purchase the chain for $2.1 billion. Now Olive Garden -- Darden's largest brand -- is facing similar problems. In this past fiscal year, the Italian chain's comp sales fell by 1.5% while guest count fell 2.8%. To stem the tide, Darden unveiled a plan: refreshing the menu and remodeling the restaurant. The new menu is called Cucina Mia (my kitchen) and it allows guests to mix and match pastas and sauces for one price. Some compare this menu to those of fast-casual restaurants like Noodles & Company. Darden is being short on details and inspiration, and is instead using vague words like "open and vibrant." What makes the remodel a bit more confusing is that Darden already refreshed Olive Garden's look with the Tuscan Farmhouse look it initiated in 2011. The method with which Darden plans to fix Olive Garden is the exact same method that failed to fix Red Lobster. What's more, Darden just updated Olive Garden with the Tuscan Farmhouse look and that also failed. I don't think the third time's the charm. Choosing to sell Red Lobster instead of really fixing it shows that Darden doesn't know how to turn a restaurant around. Ideally, you would keep the seafood chain to have a more balanced portfolio. That's why many restaurant groups choose to enter three of dining's biggest categories: Italian, American, and seafood. With the sale of Red Lobster, Bloomin' Brands (NASDAQ:BLMN) and Ignite Restaurant Group (NASDAQ:IRG) will be the most balanced restaurant groups on the market. Both have demonstrated that balance is crucial to success. For example, Ignite would have had a pretty dismal quarter with Joe's 6% decrease in comp sales. But things brightened up with Brickhouse's 10% increase. Also, Bloomin' Brands shows us that comp sales go up and down in cycles. Bonefish Grill has been a very good performer for Bloomin', but last quarter it had a hiccup as comp sales slid 1.5%. However, this didn't doom Bloomin's overall comp sales, as Outback helped bring them back up to flat. Instead of being a well-balanced company, Darden is going the way of Brinker International (NYSE:EAT), which has shown that it needs more balance. Maggiano's is a promising concept with 17 consecutive quarters of comp-sales growth, but only has 45 locations, while Chili's has 1,563. More dependence on one income source makes this more likely to happen. 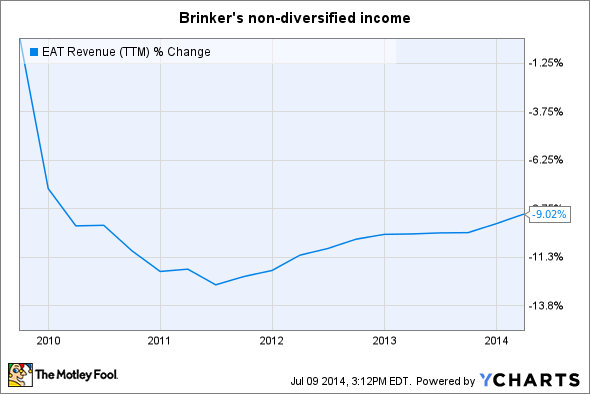 But while Brinker is actively working to grow Maggiano's to diversify, Darden is doing the opposite. And a word on the menu: if the goal is to compete with fast casual, this menu won't work. In a previous article, I demonstrated that Americans are looking for quality food and value. The Cucina Mia deal costs $9.99. But Noodles & Company costs about $8 without the tip. Once again, casual dining doesn't compete with fast-casual where it matters. While Darden's dividend and share repurchase program may entice some, I'm losing confidence in its overarching business strategy. By carefully utilizing the company's assets, management may be able to keep the stock steady, but I don't see a solid business plan for growth from here.